We had the privilege of joining the Norwegian Bliss as guests of the cruise line during its inaugural West Coast cruise out of Los Angeles. While our cruise experience was just under two days, it was abundantly clear that Bliss is the finest ship sailing under the flag of any of the major cruise lines today. Not only did it hit the mark for virtually everything I could possibly review - but it offered new experiences that will help open cruising to new audiences in search of manly adventure. 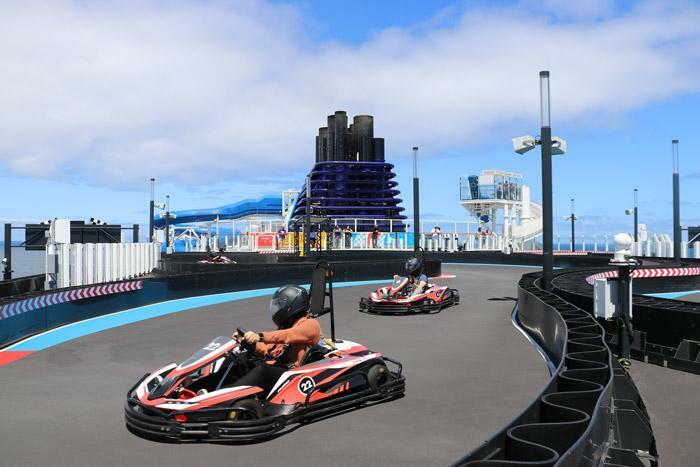 All of the major cruise lines have big ships with great bars and restaurants, but for some reason, it felt like those on Norwegian Bliss just "clicked" for me. It may have been that this was my first time with "Freestyle Cruising", but I loved it. While I still enjoy traditional cruise lines, this felt as though they chucked all the legacy garbage that has been holding the cruise industry hostage for years and truly delivered on the promise of a floating resort. I know those are fighting words for some people such as my parents who truly enjoy the more conservative experience offered by Royal Caribbean, but times have changed. I don't want to have to get dressed up for dinner, just to take the pants and shirt off an hour later so I can be comfortable again hanging out in a lounge or show for the rest of the night. The downside of this style of cruising though is that since it's less inclusive and ultimately competes on list price with the other lines, the net price you will spend is higher. I'm generally ok with that, and NCL regularly offers inclusive packages to help manage this issue. For instance, at the time of writing there is a Free At Sea promotion where guests in a Balcony Cabin on a 3-9 day voyage get to pick two free inclusions. They offer five of these including: Free Open Bar, Dining Package, Excursions, WiFi and Extra Guests (in the same room). I got the impression from talking with staff that there are similar promotions offered regularly, so make sure to keep your eyes open if you are considering a cruise on Norwegian Bliss or one of their other ships. The reality is that Royal Caribbean, Princess, and Carnival are all feeling the pressure to adapt too. However, it's harder for them to do so since they have legacy guests that truly enjoy the classic style still and they don't want to alienate them. However, after my first voyage years ago - I never ever wanted to have an assigned dining time or table. I want to eat when I want and spend time with Heather or my friends, not six strangers sitting around a huge table in a giant dining room. As we see new lines such as Virgin entering the market and cruising moving from a niche that evolved from passenger service to destinations unto themselves, Norwegian appears to be a leader in this space. Not all of the cruise ship conventions have been thrown out though. Norwegian Bliss still has a main dining room - three of them actually: Manhattan Room, Taste, and Savor. While the Manhattan Room was exactly like you'd expect from a cruise ship's main dining room (minus the huge 8-person tables), Taste and Savor were smaller more intimate venues. All three share the same menu and there's no assigned dining times or formal dress code. While you shouldn't show up to dinner in a tee-shirt and swim trunks, jeans and a polo or even shorts are perfectly acceptable for men. The general rule for dress codes here seems to be - comfort and respect for other guests. Ultimately, you should dress the way you would if you were visiting a land-based restaurant or lounge. In addition to the main dining rooms, and buffet, food at The Local Bar & Grill is also included in your cruise price. Food options there range from baked pretzels, chicken wings, and deli sandwhiches to casual favorites like hotdogs and hamburgers. 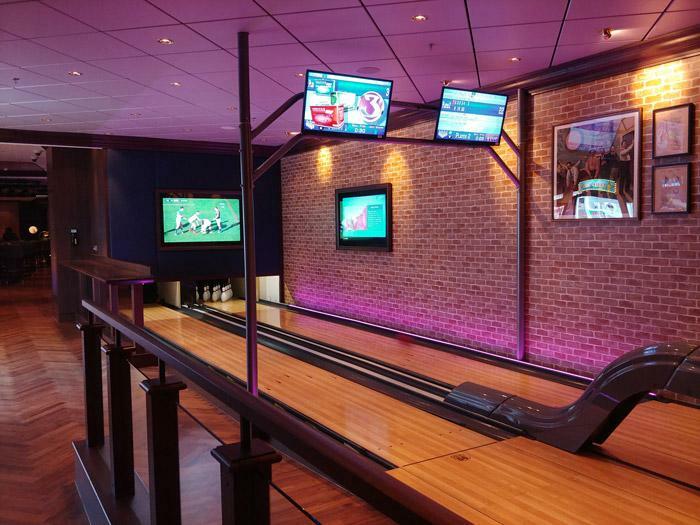 The Local also has a small arcade and bowling alley as part of it, so this is a great place to hang out any time of day. This ship is one of the newest sailing right now, so the technology, health, and safety features are among the best I've ever experienced. 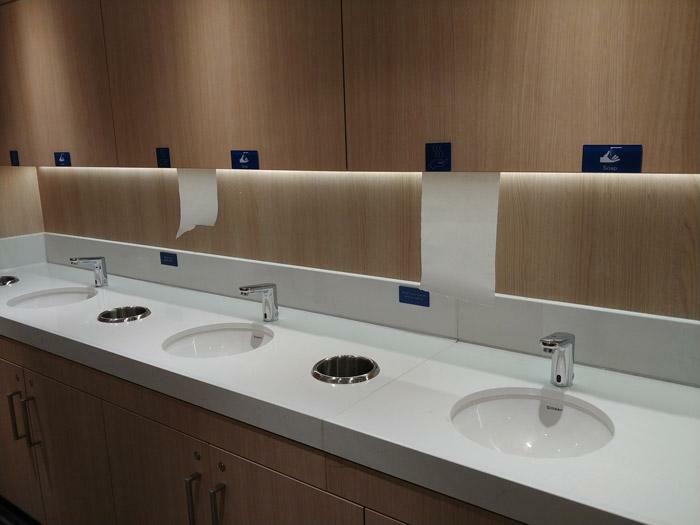 Not only did they have numerous hand sanitizer dispensers throughout the ship but there was a line of sinks at the entrance to the Garden Cafe (buffet) so you could wash your hands before and after eating. Several of the public bathrooms I visited had sliding doors so you can avoid touching handles which was nice as well. These also offered gloves and Lysol to help with keeping baby changing tables clean and protecting your hands from contaminants. While I don't expect that you're going to be using the changing tables on a guys weekend - the fact that it's well equipped means that there's less chance of getting sick from someone's kid! 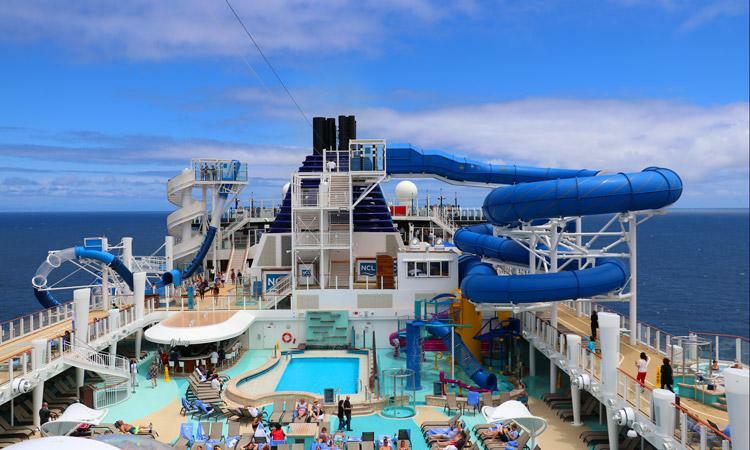 Plus, this ship would be awesome for families too - it's not just about mancation getaways. WiFi was extremely fast on the ship and allowed for streaming video services like Netflix as well as Facebook live chats. I always had a strong signal even in places like the theater and while walking down the hallways. Teppanyaki - If you are looking for dinner and a show, this is the place to go. You'll find wisecracking chefs (ours was from "South Philly...pines") cooking up a mixture of steak, seafood, and vegetables while doing spatula tricks. Unfortunately, due to this being a moving cruise ship at sea, some of the more exotic gimmicks such as flames and knife juggling really aren't feasible here. The food however, was delicious and our chef was hilarious. Ocean Blue - While the nautical decor here might be a bit cliche, we applaud Norwegian for delivering something I've been craving for years - local flavor. For instance, when you are in Alaska you'll be able to enjoy fresh Alaskan salmon and in the Caribbean you'll be able to dine on grilled snapper. Be mindful of the strict dress code here where men are required to wear long pants, close toed shoes, and a nice shirt. Ocean Blue also offers outdoor seating so you could enjoy the long summer evenings in Alaska, while dining outside as glaciers and ice bergs pass by. Cagney's Steakhouse - Your classic steakhouse experience here includes lamb and veal, steaks, and even tuna. You can also find a fried seafood platter here as well. All items and sides are served a la carte. Food Republic - Tapas fusion is probably the best way to describe this restaurant. 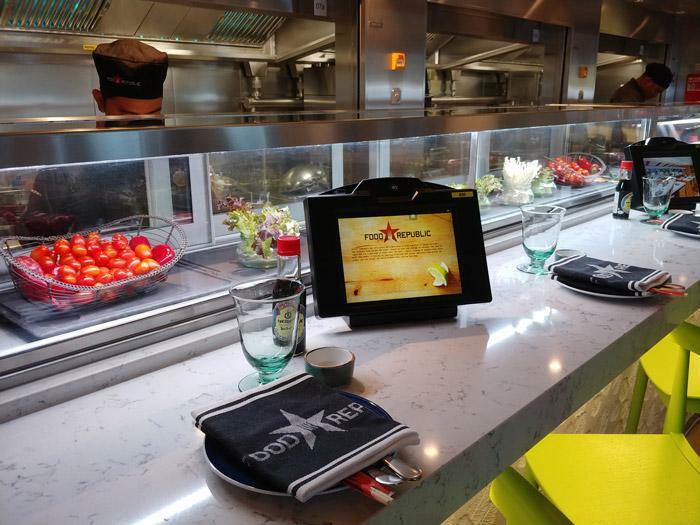 Guests use a touchscreen tablet device to order individual items one or two at a time. 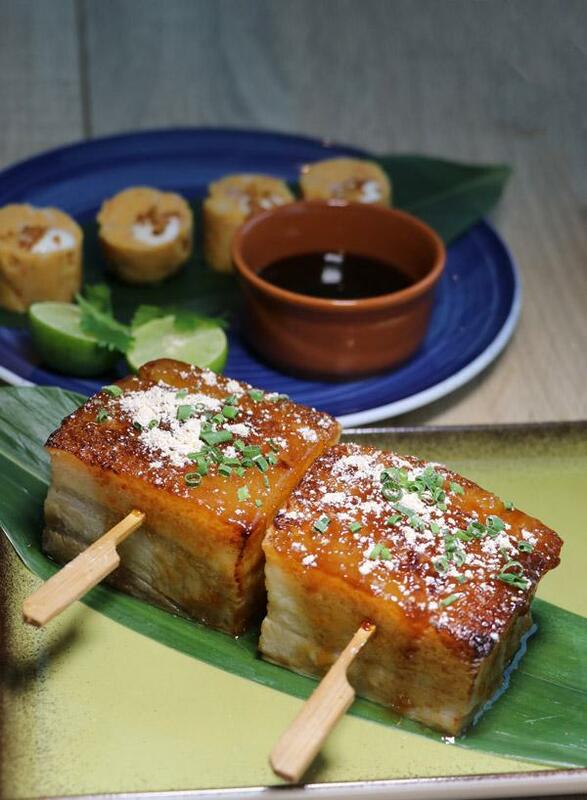 This is great for a table to share bites like pork belly and sushi or bitter melon fries (NOT my favorite but worth a taste!). Texas Smokehouse Q - From those who dined here, I'm told that this is the shining gem for food lovers on Norwegian Bliss. Not only does it have a fun atmosphere (and good drinks) with nightly country music, but the food is excellent too. The a la carte menu features Southern favorites including deviled eggs and jalapeno cornbread to brisket and pork ribs that I'm told is actually prepared in one of the only real smokers found at sea today. Los Lobos - If you are looking for an upscale Mexican experience with fresh guacamole prepared tableside then this is your spot. Items are served a la cart. La Cucina - Classic Italian cuisine like fried calamari and mushroom risotto as well as seafood and meats are available here. You can also order pizza and all items are served a la carte. Le Bistro - This is a fine dining, French-style bistro with items ranging from roast rack of lamb or veal medallions to French onion soup and a chocolate fondue for dessert. Items are available a la carte and like Ocean Blue there is a formal dress code. Jimmy Buffett's Margaritaville at Sea - A cover charge includes GREAT food ranging from MASSIVE (and equally delicious) platters of nachos to fish tacos and a great selection of burgers. No visit here would be complete though without ordering a margarita or two (at normal bar prices). The District Brew House - This is Bliss's craft beer bar but they do offer a la carte snacks including scotch eggs, tandoori salmon naan, and firecracker shrimp for a small fee that is about what you'd expect at a pub on land. 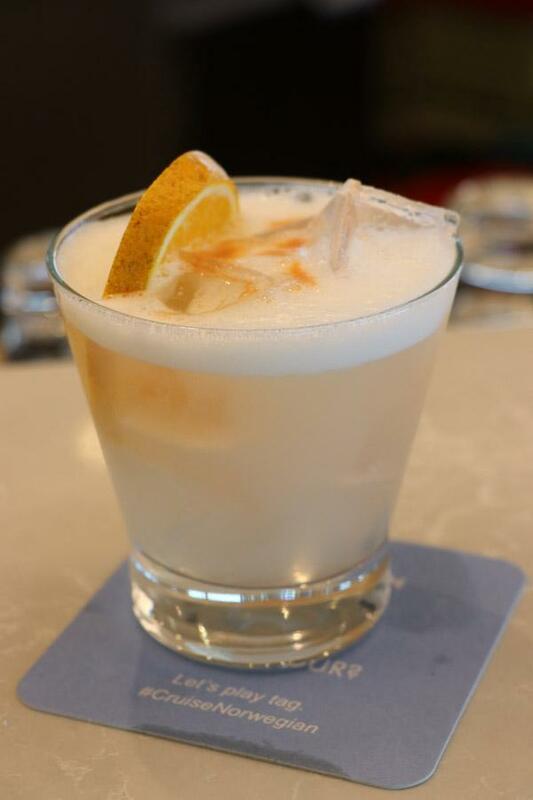 Several bars on Norwegian Bliss offer pisco sours (one of my favorite cocktails). The beverage program here on Norwegian Bliss is HANDS DOWN the best I've experienced at sea. 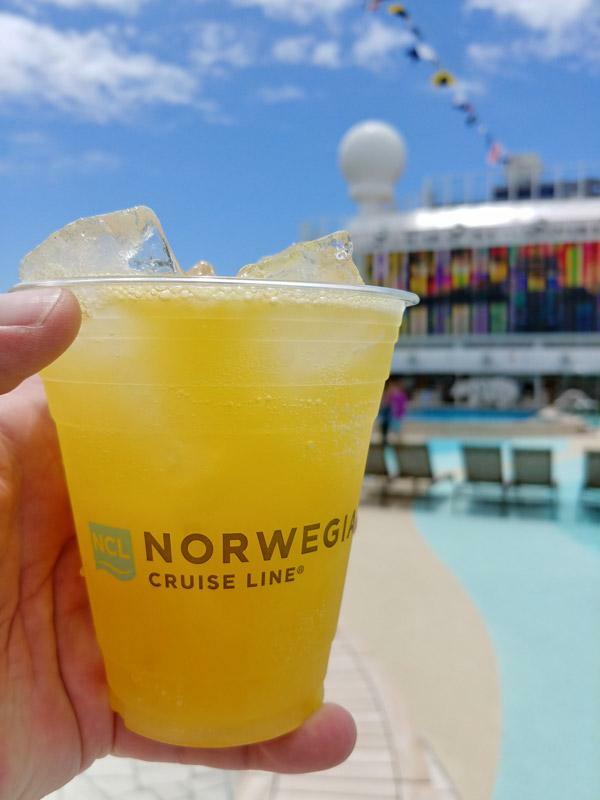 While I've never complained about the offerings on Royal Caribbean or Carnival, Norwegian simply delivers the same quality and selection that I'd expect from bars on land. 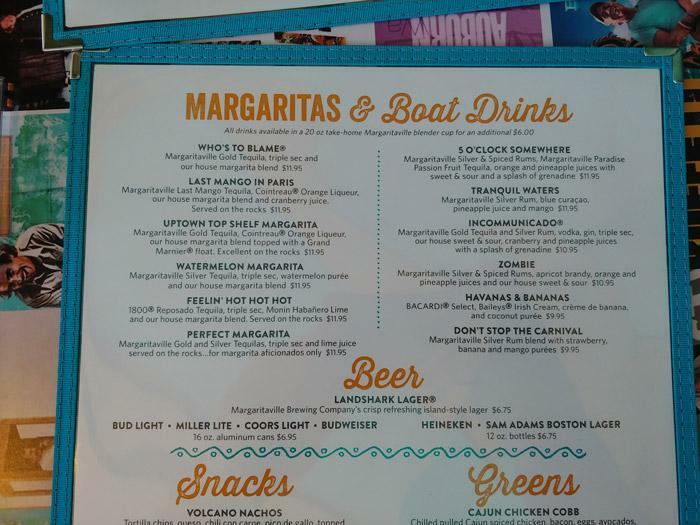 There's incredible diversity of drink menus depending on the bars including whiskey's at Maltings, Mojitos and rum drinks at Sugarcane, "fancy drinks" at The A-List (located between Los Lobos and Cagney's), and of course margaritas and boat drinks at Margaritaville. Up on the pool deck they have the classic fruity and frozen drinks you'd expect from a great cruise bar. They also have an excellent selection of wines including what appears to be their house red wine - H3 Cabernet from Columbia Crest - one of my favorites. The star show for Norwegian Bliss is Jersey Boys. Honestly though, it isn't my pick for how to spend an evening. Despite that, I found it was a great show and very enjoyable. However, the star for me and a MUST SEE, is Happy Hour Prohibition: The Musical. The show is set in a New Orleans brothel on the last evening before prohibition is set to begin. The audience are all guests of the establishment as the ladies celebrate this one last night before the days of sobriety that lay ahead. If you are looking for naughty jokes and a light burlesque / cabaret-style show while sipping on various period cocktails this is where you should go. Jokes are a bit dirty and will make you ask, "did she just say that?!" several times. (HINT: Yes she did!) Guests are allowed to take photos here and some "lucky" participants will even be invited on stage to participate (like this gentleman was ... much to the chagrin of his wife/girlfriend). In addition to these two shows, there's also a Beatles tribute show at The Cavern Club. This is a live music venue based on the club in Liverpool that gave birth to various British pop groups including of course The Beatles. 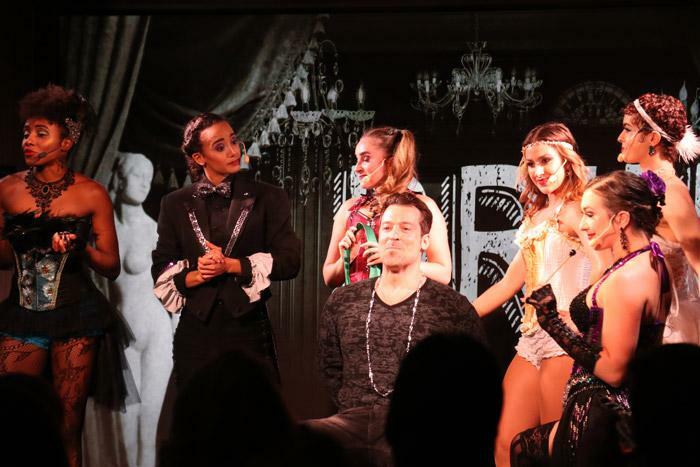 Bliss also has comedy shows, a silent disco, night club, and a musical show, Havana. Sadly, with only two nights, there just wasn't time for us to see everything. While some ships that I've been on have an inflatable arena that they open up in a large venue such as the theater, not here! 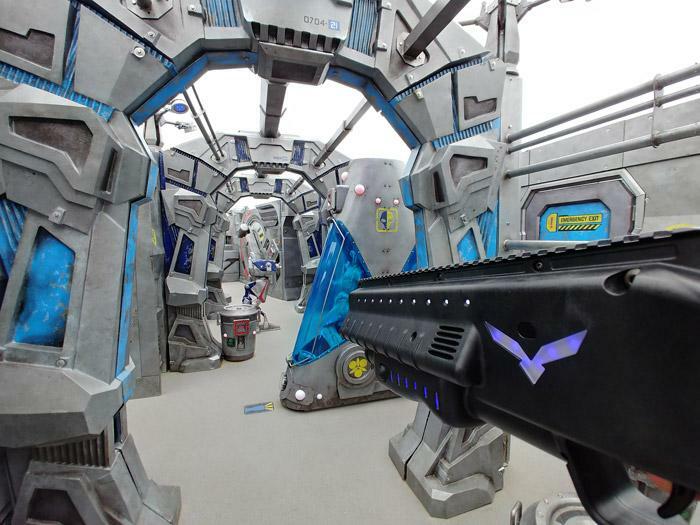 This is an honest to god Laser Tag arena where you play Marines vs Scientists fighting over a space base with alien bodies and plenty of places to hide. We played during the day, but this would be incredible at night! I'm told that this was inspired by a request from the CEO's son and so I can't wait to meet him one day and say thanks! It is one of the coolest things at sea today and just one more way that Norwegian Cruise Lines is innovating to deliver BIG IDEAS for their guests. This two-level track spans the entire width of the ship and while it's slower paced than what you'd find at home, the cars are still plenty quick. NOTE: This was a demonstration, all guests are required to wear helmets during actual races. The waterpark game has been taken to the next level on Norwegian Bliss as well. 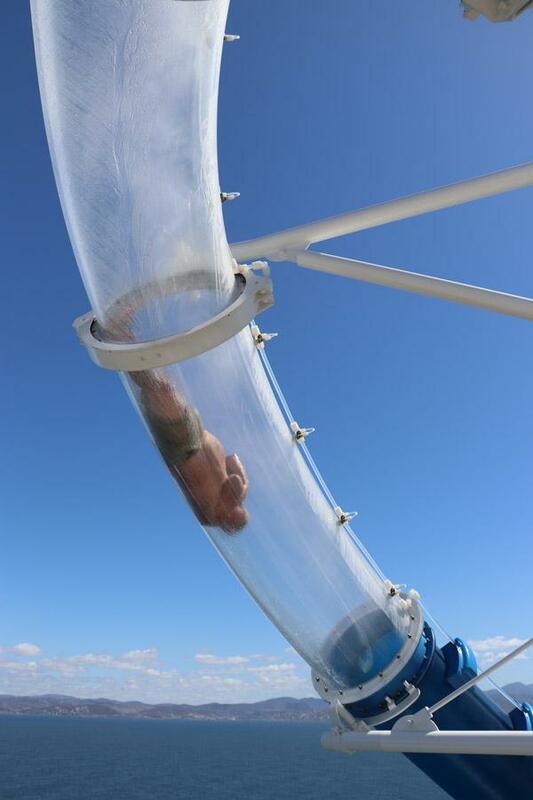 Between the double loop Ocean Loops slide that sends guests over the slide of the ship in clear plastic tubes to the Aqua Racer tandem waterslide, there's something for everyone. There's simply too many things here to include in just one article. Suffice to say, Norwegian Bliss is a spectacular ship with plenty to do, eat, drink, and explore. 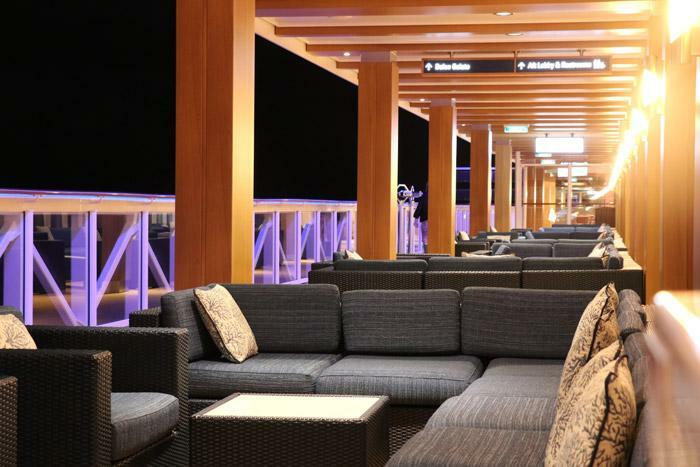 There's little things that I loved like how open it was to the outside like the Waterfront boardwalk on deck 8, with outside seating for bars like Sugarcane Mojito Bar and Cagney's Steakhouse, or simply a place to relax and enjoy the fresh air without the cliche "cruise loungers". 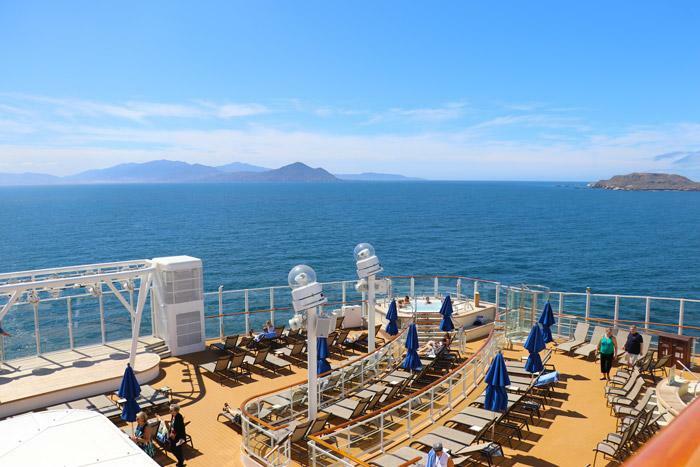 This is truly a cruise ship for those who have said, "but I don't like cruising." I can't wait to sail on her again with more time to fully experience everything that we missed the first time!